In the city center of Arezzo, alongside Casa Vasari, it lies the ancient palace of 1600 the Ubertini Conti. Within walking distance of all the attractions of the city, the old kitchens of the palace has been converted into an elegant and cozy guest house equipped with every comfort and with a multitude of small fascinating corners. 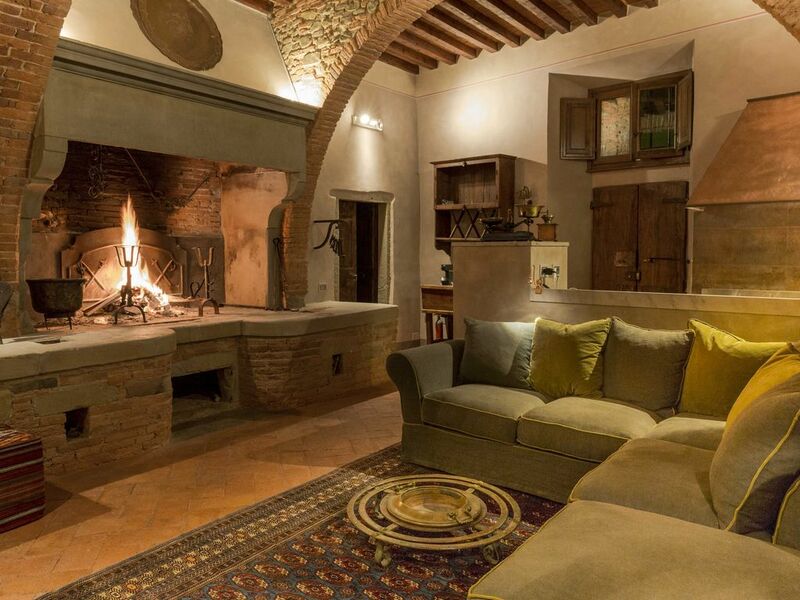 Finely furnished with antique furniture and rugs and antiques, Locanda Bellavita is a ground floor apartment with separate entrance consists of two double bedrooms and one with double bed, a bathroom with tub and a bathroom with shower, a large living room with an immense fireplace, dining room and kitchen professional cooking. First of all, Stefano kept in touch with us from the first moment we booked. He made sure we were informed every step of the way. When we arrived, we were shocked at the beauty of this home. Every detail has been thought of. You will want for nothing. All of the little details are taken care of, from the plug adapter to a candle and bubble bath in the bathroom. The location is amazing as well. 10 steps from your door, you will find a cafe with treats and coffee. Walk the area and get a glimpse at local life. Go for a drive into Siena or Cortona. It was an amazing stay. We hope to return again someday and we thank you for the beautiful work you have done to make this place a home. Thank you for sharing it, we think you did a fanstastic job restoring it. Our 4 day stay at this beautiful home was not nearly long enough. We have never felt so relaxed and at peace on vacation as we did while staying at Stefano's exquisite home. While Stefano was away, his wonderful son Giacomo made us feel very welcome. We adopted the family at the nearby Trattoria Mazzoni that serves the most amazing local cooking. The house dessert is a must(cake). Having been to Italy 19 visits now, I can honestly say we found Paradiso/Nirvana in Stefano's home in Arezzo! Looking forward to returning in 2020! Stefano has outdone himself in creating a comfortable and thoughtfully renovated apartment. It’s location in Arezzo was perfect for our trip and was accessible to all that the old town had to offer. We highly recommend the coffee and pastry shop across the street and the Mazzoni corner store down the hill. We would recommend Bellavita to anyone that wants an authentic Italian experience close to other more touristy areas of Tuscany. An excellent place to stay. This was our favorite apartment during our 10 day trip in Italy. It's beautiful and could be in a magazine. Took advantage of the fireplace and sound system. Loved everything about this place. We would definitely stay here again. The owner managed to have the guests’ total comfort and needs in mind when traveling when he designed and furnished this apartment. From the soap to the phone chargers to the speaker in the living room to the umbrella and beyond. The pictures of the apt online don’t even do it justice. It is located in a perfect part of town, quiet but close walking distance to the main action. It is totally incredible and we hope to return again. Great property! Wonderful hosts! This is now one of our favourite stops for the future!! always ready to host you again !! !